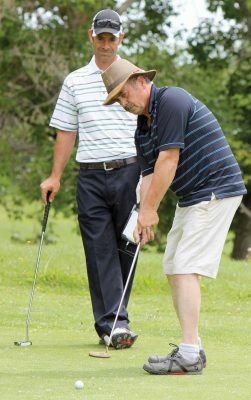 Golfers can experience the history of their sport by teeing off at the Fort Macleod Golf Club, the oldest course west of Manitoba. The game in 1890 was played on the grassy flats near the old fort. By 1895 the Royal Macleod Golf Club had firmly established itself as a part of the local sports scene. Today the Fort Macleod Golf Club offers nine holes on grass greens, with a full-service clubhouse. Situated along the Oldman River, the golf course is an oasis on the prairie with lush green fairways surrounded by large trees. par three 160-yard sixth hole to the par five 505-yard seventh hole. The fairways are lined with 60-foot trees. clubhouse. To book a tee time call 403-553-4664.